Hi all hope everyone has had a good weekend. Well I have been busy making my Mother in law's Mother's Day card which I have enjoyed making. I used my die'sire lace border to cut coordinations card stock. I cut flowers from my Die'sire lace flower die as well as the stamen die'sire die. I used the sentiments from the sentimentals rubber stamp plate, and used the die'sire tag die then coloured it in using squeezed lemonade ink pad. Aww Sam that is so cute, love the image and the colours you have picked I am sure your Mother in Law will love it. Thanks for the comment you left on my blog it was so kind. Another beautiful card Sam, your mother in law will treasure this I am sure. 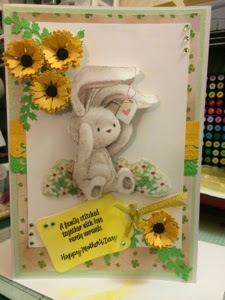 Beautiful Mothers' Day card - love that cute image and the fabulous colours you have used. Your M-i-l will love it!! so cute and a gorgeous card Sam. Such a sweet Bebunni creations Sam. Love the design and detail. Beautiful Sam. Love the flowers.